The Objective: To study the air flow inside oil tanks provided to scavenge the fuel vapors through the outlet. Solution: The tank designed for oil storage was first modeled through CAD tools and the simulation domain was identified to obtain the air distribution across the tank. Cement industries are prominent in consuming energy and its efficient utilization has always been a matter of priority. The total energy costs averages from 30 to 40 percent of the total cement production costs, urging manufacturers to adopt innovative solutions to minimize energy consumption. Oil storage tanks are prone to explosions during instances of temperature rise in surrounding environment. Due to a rise in atmospheric temperature, there are chances of formation of oil vapors, which remains trapped inside the tank. In order to avoid hazardous situations, tanks are always provided with vents to allow the trapped gases to escape from the tank. One of the leading offshore equipment manufacturers in Australia developed an oil storage tank that involved forced induction of air through the inlet, assisting in scavenging the gases from different compartments separated by baffles through the outlet. 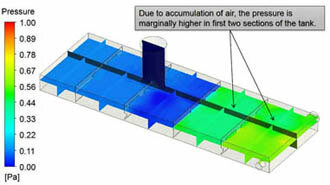 The oil tank was developed through CAD tools and the air flow domain was identified based on the oil height level. 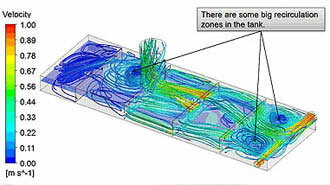 Baffles separating the tank in compartments were also modeled and the air flow was simulated, considering required boundary condition and the turbulence model. It was observed that the air flow was sufficient in first two compartments, yet, there were recirculating zones, reducing the flow velocity in other compartments. Also, it was measured that the pressure in the first two compartments were comparatively higher, due to accumulation of air due to recirculation.